New Delhi, India – His Holiness the Dalai Lama was today invited to Teen Murti Bhavan, former residence of Prime Minister Jawaharlal Nehru, by the Editors’ Guild of India to deliver the Rajendra Mathur Memorial Lecture. Treasurer Kalyani Shankar formally welcomed the 350 strong audience. President Raj Chengappa then introduced the occasion. He observed that as India prepares to celebrate 70 years of independence, she still has a robust media. He noted that the Editors’ Guild was founded in 1977 and that freedom of the press, reflecting the freedom of the population, is an integral part of Indian democracy. He explained that the Guild has organized an annual lecture in memory of the distinguished editor and journalist Rajendra Mathur since 2002. Last year Amartya Sen spoke about having no tolerance for intolerance. This year the Guild was pleased to welcome His Holiness, who he described as a shining beacon of peace and spirituality. “It is indeed a great honour for me to speak to you on this occasion,” His Holiness began. “This world belongs to the 7 billion human beings alive today. Each nation belongs to its people, not to their kings or queens, elected leaders, spiritual leaders or dictators. And in order for people to take responsibility for their lives, democracy is the best system. “When I was a child in Tibet I realized that our old system of government had many drawbacks—too much power in too few hands. Apart from the ‘Tibet Mirror’, published in Kalimpong that reached us occasionally, we had no newspapers. My sources of information were the sweepers in the palace. His Holiness explained that Tibetans had undertaken various projects to keep their culture and traditions alive. In his first year in Mussoorie plans were laid to introduce democracy. After the election of the leader of the Tibetan administration His Holiness retired from political activity and put an end to any future Dalai Lamas taking such a role. “As an admirer of democracy I am committed to it. We are proud of what we’ve achieved so far. In this respect our small community is more advanced than our great neighbour China. Eventually she may follow our lead. India is the world’s most populous democracy and, as a result, is evidently more stable and peaceful than her neighbours. The enduring tradition of ‘ahimsa’ has also meant that India is the only country where all the world’s major religions live together peaceably. “Since the people have the ultimate responsibility, they need to be fully informed about what is really going on. Therefore, the media should be honest, truthful and unbiased. However, it seems to me that the media tend to pick up negative stories and to sensationalise them to attract readers. When people are only fed negative news they become despondent and worry that the future is dark. “Consequently, I believe that the media have a responsibility also to highlight positive stories, such as scientists concluding that basic human nature is compassionate. It’s necessary to give people hope. Since we are social animals, who are brought up to value love and affection, it’s important to try to create a more compassionate human society. “Another aspect of this is to examine whether today’s education system is really adequate. Since so many problems we face are man-made, and many who give rise to them are educated, it’s reasonable to re-examine the kind of education we are providing. By and large, mainstream education is focused on material goals, paying little attention to basic human values. His Holiness explained that in addition to his commitment to raising awareness of the oneness of humanity, to promoting religious harmony and preserving Tibetan culture, which is essentially rooted in the Nalanda Tradition, he feels committed to reviving ancient Indian knowledge of the workings of the mind and emotions in this country. 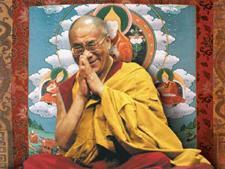 He stressed that almost all Tibetans’ knowledge comes from India. This is why a 14th – 15th century Tibetan master said that until the light of India was brought to Tibet, it remained in the dark, despite being a Land of Snow. His Holiness recommended that members of the media think seriously about making people aware that while education with material goals may bring about physical comfort, there is more to finding peace of mind. He said it’s not just a matter of reciting a prayer or mantra; it’s about transforming our emotions. He mentioned the 10,000 monks and more than 1000 nuns who have been trained in the Nalanda Tradition. Many are also well versed in English, Hindi and Chinese, as well as being familiar with science. Guild President, Chengappa started by asking His Holiness’s advice about the Indian-Chinese standoff in Doklam and the current talk of war. He replied that it is a significant issue, but that India and China have historically been neighbours. They have to live side by side. And although harsh words may be exchanged he didn’t think it would become more serious. He advised that a distinction be drawn between the Chinese authorities and the Chinese people and recommended that the Government of India improve facilities for Chinese Buddhist pilgrims to come to India to visit Bodhgaya, Sanchi, Rajgir and so forth. This could serve as a confidence building measure. He said that China needs to change, but that over the last 30 years great changes have taken place. Asked if he hopes to return to Tibet, His Holiness answered that he also refers to himself as a ‘Son of India’ and that he would not like to give up the freedom he enjoys here. It’s a freedom that allows him to share his views with others. While recognising that he is a stateless refugee, he functions as a messenger of ancient Indian knowledge, which he feels makes his life meaningful. 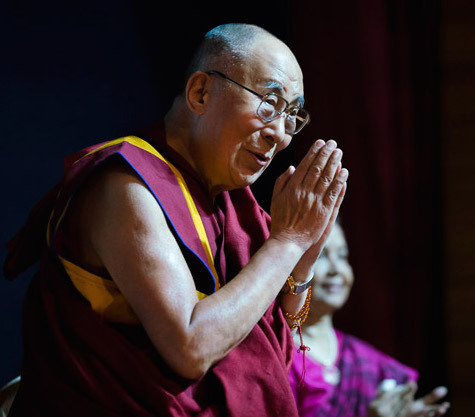 In response to the common question about whether there will be a fifteenth Dalai Lama, he reiterated his position that as early as 1969 he made clear that it will depend on the will of the people of Tibet, the Himalayan Region and Mongolia. He agreed that if it were useful, a future Dalai Lama could be a woman. Answering a follow up question about women and education he explained how the criterion for human leadership in the past had been physical strength, which gave rise to male dominance. Since then, education has restored some equality. He stressed that at a time when we need to encourage the adoption of inner values like warm-heartedness, more widespread female leadership is essential. He also dwelt on the importance of teachers and that because they can promote far-reaching change their kindness may be regarded as greater than that of doctors and nurses. The hall was filled with warm applause as General Secretary, Prakash Dubey offered words of thanks. His Holiness’s departure was delayed by the number of people who pressed forward to exchange a few words, to shake his hand or touch his feet. He returned to his hotel for lunch.